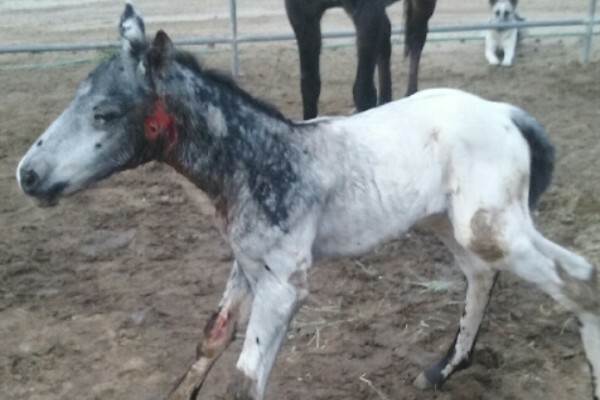 Shortly after his birth, a newborn fewspot purebred knabstrupper colt, a rare spotted warmblood breed made popular in the Pippi Longstocking tales, was attacked by a California mountain lion and dragged from his stall run. Thankfully, the family dog took pursuit and chased the big cat off allowing the colt to be retrieved. 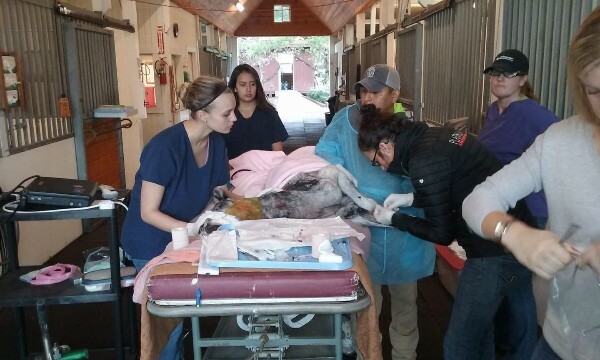 He is fighting for his life after suffering multiple puncture wounds to both sides of his neck, allowing air under the skin and has pneumonia. He is being treated at a nearby equine hospital today, and it is touch and go, and we are asking for help and prayers to ensure his chance at survival and that his rare breeding may have a chance to carry on. Please consider helping this holiday miracle and his family in his fight for survival. They are doing their best to help him at the hospital. Thank you, SLREH staff! 12/31/2016 - Day 2 - Morning UPDATE ON THE COLT! I just spoke to the docs at San Luis Rey and there was some good progress during the night. Not out of the woods, but he's a little stronger and has been able to nurse off the dam. Still has to be kept separate from her for other IV fluids, but this is good news. They are aggressively battling the pneumonia he developed, and the treated tape is keeping the neck wounds from sucking air and creating further problems. We are not out of the woods as yet, but things are looking better for him this morning. UPDATE on 12/30/2016 - Day 1 - EVENING This is Diane Truxillo. Patrick and I are the owners of Phlicka, the dam. Lisa is the owner of the sire......and she was kind enough to put this up while I was coping with things at the hospital..... Little man was so weak from the attack, he never had a chance to nurse, so missed out on colostrum right away, and this aided in a complication and he developed pneumonia. At the hospital, they were able to milk Phlicka and tube feed him her milk, so he did manage to get her colostrum before it was too late, but the battle was already waging, so we are praying it was not too little too late. As of 5pm this evening, he was holding his ground. He'd been fed a couple times, had urinated and passed more merconium (sp?) and had even sat up a little, but he's too weak to stand, and they are trying to keep him calm in any case. He has a breathing tube to help, various IVs and they will continue to feed through tube for now. He also has to have someone sitting with him full time, hence why this is costing a fortune on a daily basis. Unless something drastic happens through the night, I will not get another update until they have evaluated him in the morning. Its been almost a month since our colt was attacked by that mountain lion, and I can tell you.....he's amazing! Such a fighter, and he's honestly at a point that we are feeling that he's beat the odds. He's gotten past the pneumonia, and the wounds are almost completely healed to the point where the bio-security for his safety has been put aside. This has not been an easy ride, for him or for his caregivers.....but he's a fighter and he has an amazing team in his corner! To EVERYONE that has graced us with donations....THANK YOU!! The hospital bill for the first few days was nearly $6K, and the continued care costs for multiple vet visits and all the supplies for this past few weeks has been nearly that much again. All of your donations are helping cover those costs, and even though other bills were put aside and will need to be addressed, Charlie's care has come first. Thank you!!! God Bless all of you!!! I will be creating a Facebook page for Charlie, and will be posting the link here for any and all of you that might want to follow him and his continued progress. What a terrible ordeal! Prayers go out for this horse' healing! I have no idea where all the later comments we posted have gone..... Update to all or anyone that is curious - CHARLIE and Phlicka are fabulous! He survived it all, has some scarring from the bite wounds, but is a healthy and sometimes obnoxious colt, which is PERFECT! Thank you to everyone who donated and helped out! Its so very appreciated!! UPDATE 01/13/2017 Well, its been a few days since I posted an update, but that is basically because there was nothing new to post. We have given him a name: Charlie This is because of the 3 amazing Angels he has looking over him during this recovery. I just seemed appropriate. Charlie is doing great! He's mending and the bite is no where near as scary looking as it was a few days ago. He's still battling with the pneumonia, but the vet seems confident that he's winning on that front as well. Bloodwork was drawn and his white cell is still a bit high, but that was to be expected, so he was given another dose of Exceed. Thank you and blessings to all of you for your donations.....you have no idea what all of this means to us. Bills for his recovery are up over the $8K mark. 01/06/2017 - UPDATE Ally's prototype head cover actually worked to keep the bandage mostly on, but most importantly kept the wounds covered for almost 12 hours. Between bandage changes. He gets it done along with AM and PM shots. (His poor booty) Added benefit to cover is I made it out of towels so it is washable, and it absorbs the fluid that oozes from the wounds. This will help prevent further neck scald. The neck scald is VERY itchy and him rubbing mom and his legs and anything else that will stay put for a few moments is what is dislodging the bandages. He has 4 smaller abcesses that are lower on the neck than the bite wounds. One of them popped open and is draining well. So it got flushed along with all the other openings on the neck this morning. He is starting to fight with a bit more energy while his medical stuff is being done. (3 injections daily, 3 oral meds daily, 2 bandage changes unless he removes it) which is a good sign of increasing energy and strength. He is however exhausted after each session and nurses then naps. Pictures were taken today, there is little change. They won't begin to close for some time still. Praying we soon start seeing the granulation in the tissue that means it is starting to heal and build new skin. No fever noted in last 24 hours. UPDATE: Day 6 & 7: Evening --- 1/4/17 & Morning 1/5/17 There is a link to GRAPHIC PHOTOS OF THE INJURY are located at the bottom of this page on the auction fundraising site. http://savetheknabs.weebly.com/updates.html The necrotic tissue has now sloughed off both sides so a very clear picture of the punctures is revealed. There are 4 deep holes on the right side of his neck. The left side wound is a 3 inch diameter hole and quoting the vet, "the back of his thyroid can be palpated from that wound." He has twice daily bandage changes with lavage into the wounds, 3 shots daily, 3 meds orally twice daily, temp monitoring throughout the day. If not for his fighting spirit, he wouldn't be in an intensive rehab program. He is still round the clock for care. It's a blessing the person helping with his care is an insomniac! All things considered, he is extremely well mannered and quite a good patient. He was released AMA due to the current condition of the wounds but continued hospitalization was quite cost prohibitive.... thankfully his attending doc was confident in the person doing his "at home care", Allyson Moncrieff Gagnon, in being able to do what needs to be done. The location of his wounds makes bandaging quite challenging. NO TENSION can be used to keep bandage in place. Harder than it sounds I promise. He is still in great need of prayer and even the at home care is costly for supplies needed. Though all updates have been very positive, he is in no way close to the edge of the woods ready to exit them. UPDATE - 02 Jan 2017 Phlicka's little boy is doing well. They have removed him from the breathing tube and he is now able to be in with Momma full time. They did an ultrasound and he does still have a fairly good case of pneumonia, but seems to be responding well to treatment. Still waiting on bloodwork to come back, but did find out that they had done an IGG and forgot to tell me that he had come in well north of 800 even with the late start on getting the colostrum. They took the bandages off the neck wound today and there is, as expected, necrosis. Due to the location, they cannot debride the wound, so they are having to treat the necrotic area in other ways. It was a miracle that the bite didn't damage the main vessels and normal wound debridement would probably finish the job the cat started. With apparently responding to treatment on pneumonia, now the larger concern is fighting off the infection and complications in the area from the necrotic tissue. Just found out and very happy for you and Charlie. Love ya. Here's to hoping he gets better soon and forgets all about the attack. Hoping for a speedy recovery! !